Raffia and sea grass hang off the walls, cascading into fountains of chaos. Books are strewn about – a variety of subjects grabs my attention. Boatbuilding in Ireland, criticism by Dave Hickey, Third Wave Feminism rhetoric, and essays by John D’Agata all influence me. 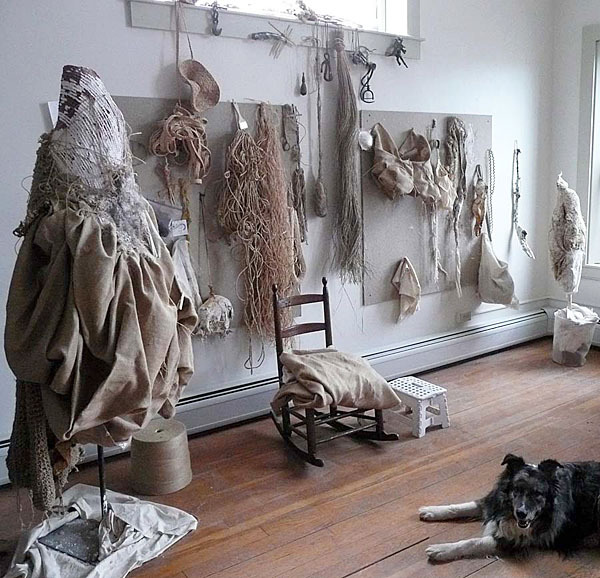 I wander about the studio stitching, cinching, unraveling, and revealing different layers of fiber. Weave, unweave, stitch, suture, and skin over with wax, tar, cement, whatever raw materials I can find and manage with my hands. The chapters of my life unfold in work. Abstraction, mystery, concern, aggression, and sexuality I am unable to speak of — but are in the forefront of my mind. My hands do not resist the taboo but thoroughly embrace it, relish in it. It’s as if when my hands are working the truth of my thoughts sneaks around my hesitancies and asks the materials — begs them — to be bold, to hold court, to challenge, and suggest. The work is braver than I am. 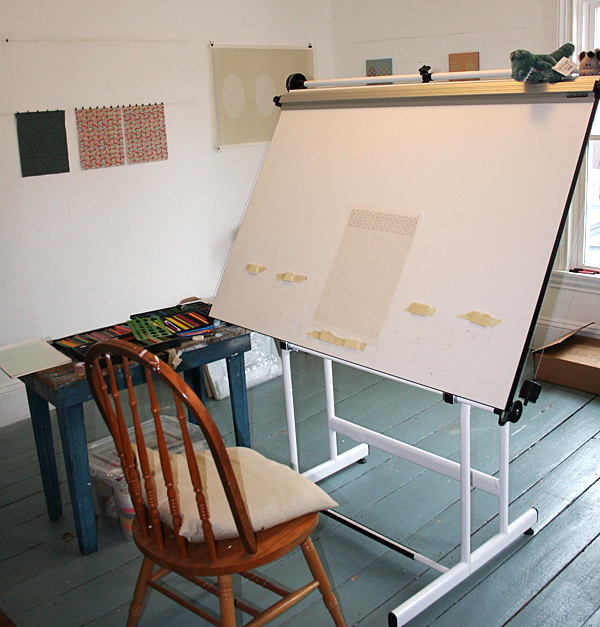 I tried to take a more inclusive photo of my studio, but no matter the angle, my drafting table is the main event. It’s fitting because I spend more time there than just about anywhere else. I wanted to make sure my pencils were in the shot, because I always get a lot of questions about the materials I use to make my drawings and it’s really down to those pencils right there. I have 120 colors, which, amazingly, doesn’t seem like enough a lot of the time. That stuffed alligator and donkey have been my audience for a long time. I don’t know how they ended up there, but they’ve become part of the architecture. They look a bit like they are heckling me, but they’re not. Also, that’s my largest drawing to date in the background! March 15, 2013. 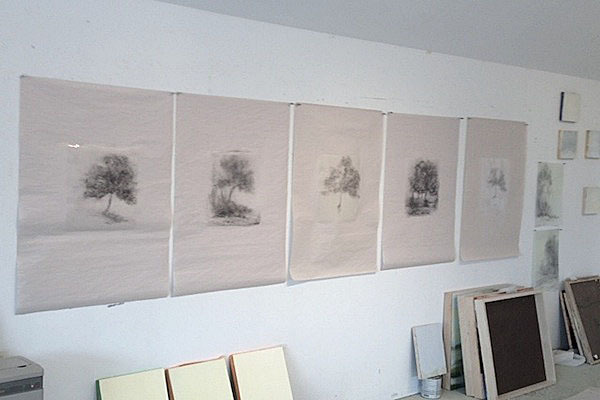 Completed a short suite of drawings, acetate, oil, and graphite on newspaper. Mainly playing with the juxtaposition of delicate drawings on slick, glossy acetate (which is less forgiving than Mylar) against the work-a-day nature of newsprint, which has a natural element of its own. Not sure where these are heading other than as stand-alone pieces, like pillowcases drying on a line. They are a combination of realistic information with imaginary impressions.